Crochenit combines the art of knitting and crocheting with just one needle. It's fairly easy to do and lots of fun to learn this technique. Another similar technique but a little more difficult to learn is Tunisian Crochet . It's much faster to and easier to do, and uses less yarn than regular knitting or crocheting. 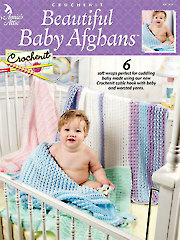 Crochenit allows you to make hundreds of different patterns from baby booties, potholders, to large afghans and more.